The Bergamasco retained the inborn characteristics which make the wolf a pack animal, i.e. the inclination towards personal ties and acting in collaboration with other members of the pack and, consequently, the capacity for maintaining constant communication. On the other hand, the assimilation resulting from a millenary domestication process have laid the basis for reciprocal understanding and exchange of information between man and dog. The combination of these two factors made it possible to establish a bond which formed the base for collaboration between the two species. So the relationship which ensued between shepherd and Bergamasco is absolutely unique. In this manner, a silent dialogue took place in which it was always the dog to take the lead by fixing the shepherd with invisible eyes, straight in the face, always ready to catch every slight variation in his expression, in order to be able to interpret his intentions. In order to really understand the Bergamasco, it is important to correctly interpret this characteristic attitude. One must not forget that in the wolves’ world, the direction of a stare is of fundamental importance. To stare intensely at a similar is interpreted as a challenge and promptly provokes an aggressive reaction by the dominant animal which has the privilege of being the only member of the pack allowed to do this as a sign of dominant leadership. The fact that a direct stare is a deeply ingrained habit in Bergamasco, shows once more that it is not submissive, but is associated with man on an equal basis. When the Bergamasco and the shepherd conducted their flocks across the Alpine valleys, they were brought close together and the solitude and isolation in these zones made their bond all the stronger. Because of the life they led and the work which they carried out together, the dog became more part of the human world than of the flock’s. On one side was the flock, on the other the two of them: shepherd and dog. In view of this particular working relationship, not much was needed in order to understand each other; both were equally aware of what had to be done. A whistle, a gesture, one word was enough to set the dog in action: what it had to do and how to do it required no further commands. The Bergamasco’s sharp intelligence was always stimulated through the centuries by the necessity to solve problems of new types under always differing circumstances. This required great flexibility and a precise understanding of the object of its work. The Bergamasco is a family dog in the true sense of the word. His entire hereditary pattern is deeply fixed in the breed and, although its lifestyle has changed, the Bergamasco is still the same. So now the family is his new flock. He does not select a "master" but thanks to his great sensibility, he behaves in a slightly different manner towards each of the members, adapting to their personal temperaments and acting accordingly. Friendly, affectionate and spontaneously obedient because he is the one looking for connection, the Bergamasco will never blindly execute orders. It is impossible to make a robot out of him. Although not instinctively aggressive, the Bergamasco is an excellent watch dog because it doesn’t like strangers invading his world and energetically expresses this aversion by preventing them from stepping over the boundaries of "his" property. But when released from his duty of guardian he is friendly with anybody. Its relationship to children is something special; their presence awakes its most profound and primitive instincts, first as wolf and then as sheepdog. 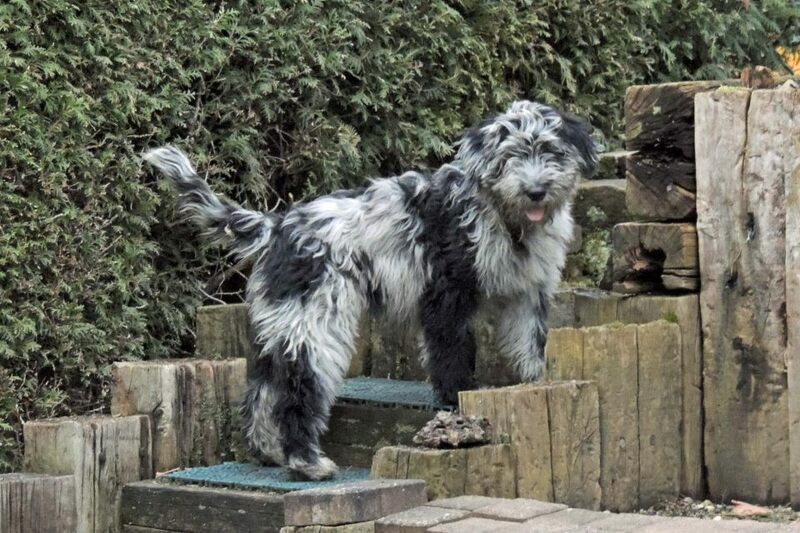 In our modern world which has become so superficial and lacking in values, I think that growing up with a Bergamasco is a highly significant experience for children. The Bergamasco is certainly not everybody’s dog. Its appearance, its temperament and its wonderful gifts of sensibility and intelligence, all that it represents of antiquity and modernism, have made it into a precious rarity which it is not easy to understand completely.